Kuja Kuja is the world's first business intelligence platform for the humanitarian space. It is a real-time, fully transparent customer feedback service that invites refugees to rate the services around them and provide ideas on how to improve these. 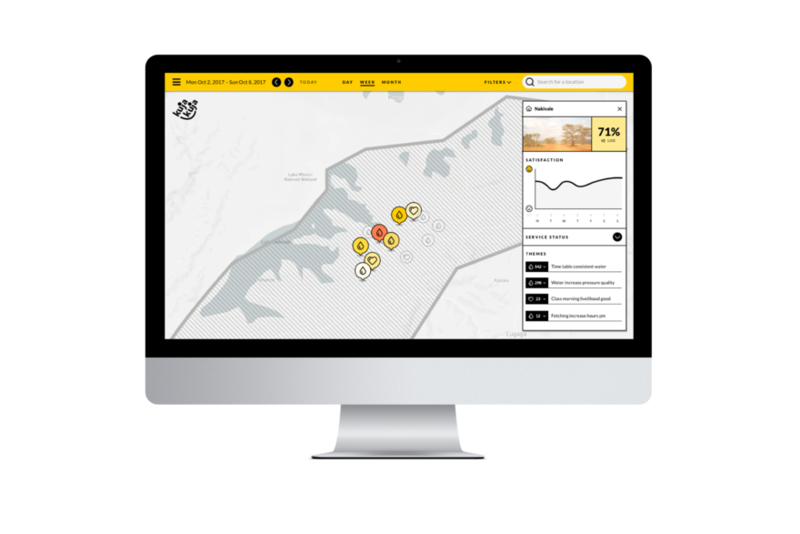 The insights that Kuja Kuja generates from its data set have the potential to fundamentally shift the way humanitarian organizations serve refugees. IDEO.org partnered with the American Refugee Committee, an organization that provides services to 3.5 million refugees across Africa, the Middle East, and Asia, to reimagine a future where refugees shape the services provided to them and have to power to hold humanitarian organizations accountable for providing world-class service. 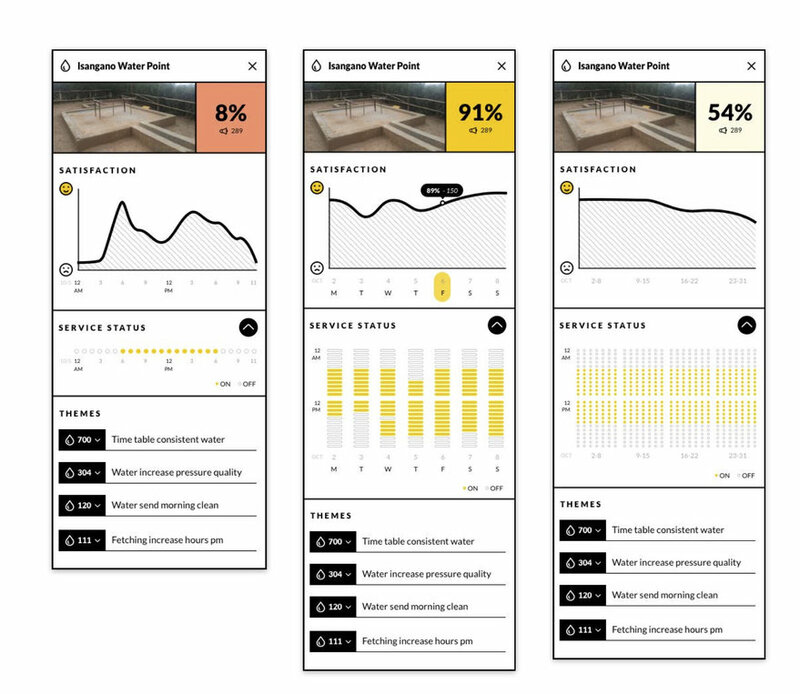 After working alongside staff and refugees, prototyping different feedback systems, we found it was vital to build trust among refugees before requesting information from them. This led to the creation of a technology-enabled, human-powered feedback system that elevates refugee voices every day. The name, Kuja Kuja, literally means "come, come," and is accompanied by a bright, friendly brand and logo that "smiles back at customers." The ethos of the brand is also reflected in the joyous, friendly tone of the Kuja Kuja team. 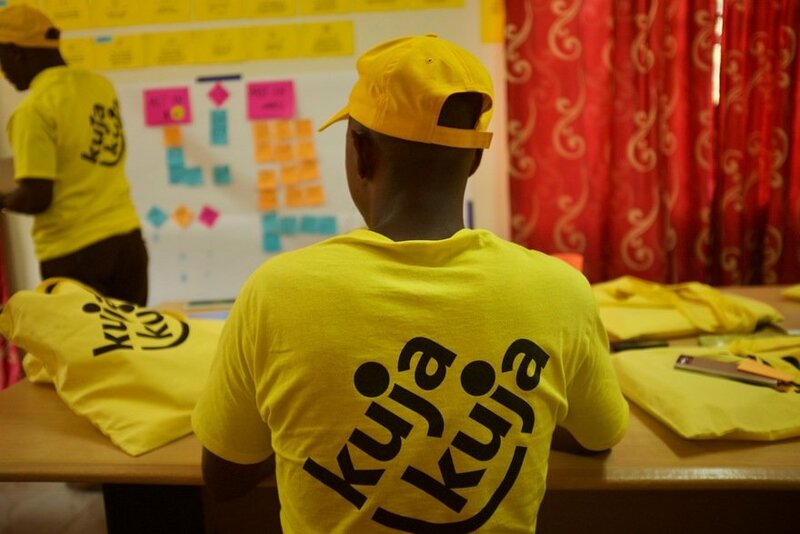 The feedback gathered by Kuja Kuja teams is aggregated into an interactive platform that not only delivers customer insights but also builds empathy. Staff can see actual images of the service points and place themselves into the lives of their customers through the ideas that those customers share on a daily basis. This digital platform helps local and global ARC staff prioritize action in real time and bridges the geographic distance in a human way. Kuja Kuja has expanded to four countries and collected more than 200,000 satisfaction ratings from refugees. Since its launch, ARC has seen customer satisfaction rise by 20 percent in Uganda's Nakivale Settlement (where they deliver clean water to 85,000 people) and 18% in Rwanda's Mahama Camp (where they manage the Health Facility and treat 40,000 patients per quarter). The platform is the first of its kind and entirely public, a bold move for a humanitarian organization working in such challenging conditions. This work is part of the ARC's larger mission to reimagine humanitarian aid for the 21st Century, and IDEO.org is committed to designing that future alongside them. Ensuring refugees get the services they need—from food and water to education and health care—is a herculean task managed by a complex web of international organizations, governments, and communities. The scale of these operations is immense—but historically, the focus has been operational. Decisions are centralized; there's a lack of transparency; refugees don't always understand what the services are, or who's providing them; and, there are limited feedback mechanisms to track or respond to refugee satisfaction. Our users in this project are these refugees as well those who provide services to them. The goal for this tool is to align the decision making apparatus of humanitarian organizations around the voice and needs of the refugee. Prototyping is integral to the design process. And, it happens early on. 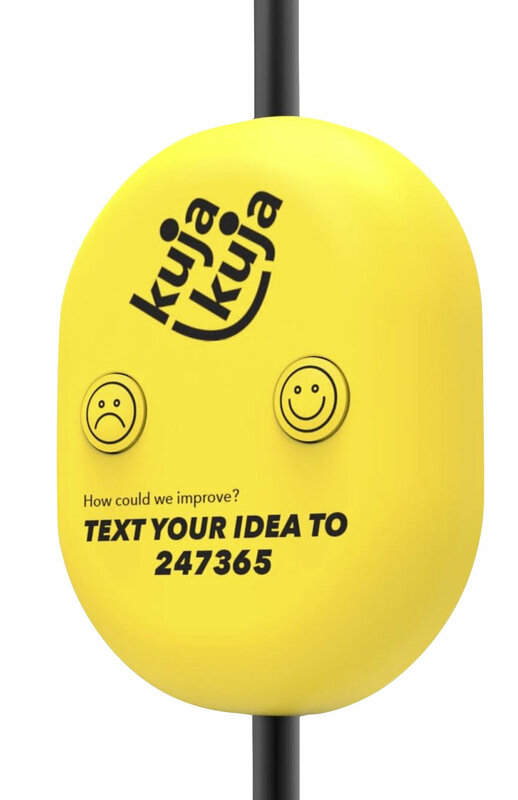 We prototyped different feedback systems to gain insights into peoples' receptivity (or lack thereof). These initial iterations helped us hone the version of Kuja Kuja you see today. Initially, we experimented with an interactive voice response (IVR) system where refugees could call in and give their feedback. Although they appreciated not having to go to the ARC office, they preferred in-person interactions. We wondered if it was sustainable to have an IVR platform in many languages. How would we share the feedback results with refugees and partners? Is IVR truly inclusive? Do enough people have access to phones? When we tried mobile text, we found that there wasn't already an existing texting culture, it was expensive for them, and the cost to set up a toll-free number in Uganda is very high. We even tried a more tangible solution, an open mailbox, so people could write letters with feedback. People were fairly receptive. However, we weren't sure if this system would be scalable. How would the letters be responded to, individually or at a community level? How would the letters be digitized and shared with ARC HQ? One of our later prototypes was a physical machine that gathered binary feedback from the refugees. It had two buttons (a smiley and sad face) refugees could press to rate their experience. This initial prototype might be viable in the future when the clients are more familiar with the dashboard. But it lacked a human element. We found that, before demanding information from the refugees, we needed to build trust in the system and familiarity with technology that might initially seem foreign. Trust works in both directions. 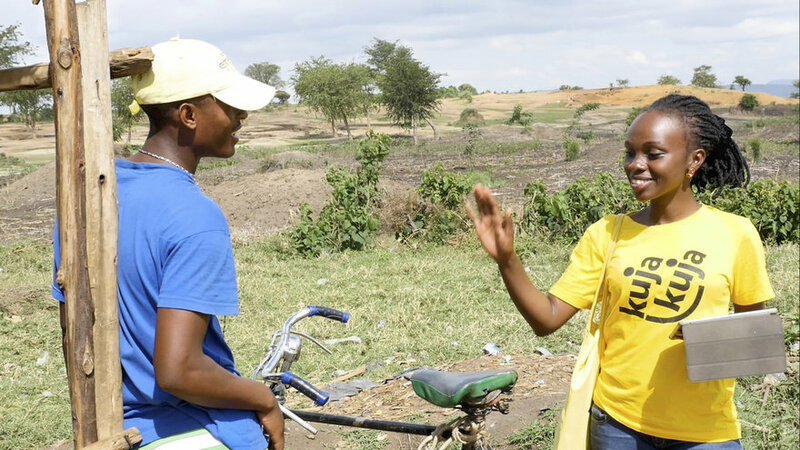 In order to establish trust between the Kuja Kuja team and the local residents we needed a system built on a foundation of honesty and mutual accountability. Each Kuja Kuja team is made up of refugees who live in these settlements. We wanted to raise up a friendly brand and team at each site that would smile at the client. This customer service experience is a critical piece in building trust with the community and is captured in a dynamic, bright brand book. Before launching the final prototype, we stress tested the dashboard to make sure it could handle a high volume of responses and settlements, given the platform's ambitious goal of reaching one million responses this year. 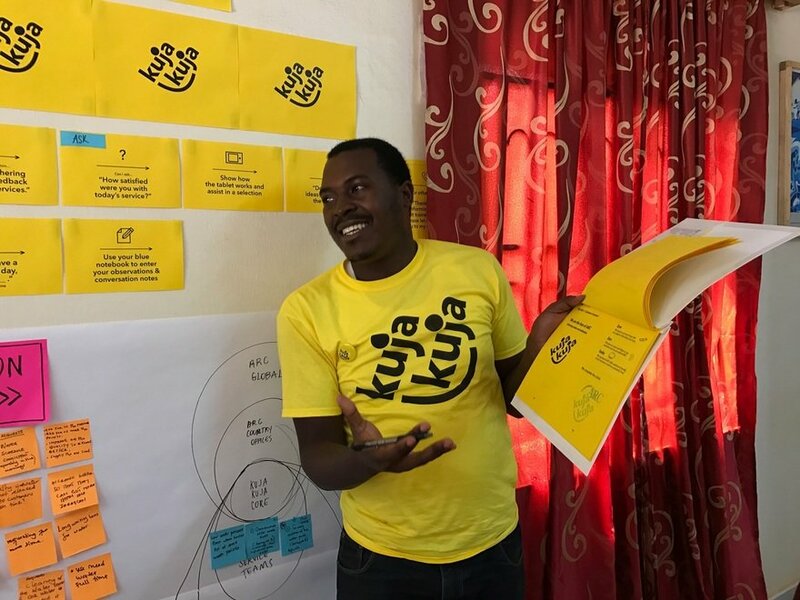 Since its inception, Kuja Kuja has continued to scale in different countries, tackling different kinds of services, and building empathy along the way.